The Adafruit Trinket M0 is a tiny (27 mm x 15 mm) ARM development board with an onboard RGB LED, USB port, and range of I/O broken out onto 5 pins. The default configuration can be found in the Kconfig file boards/arm/adafruit_trinket_m0/adafruit_trinket_m0_defconfig. 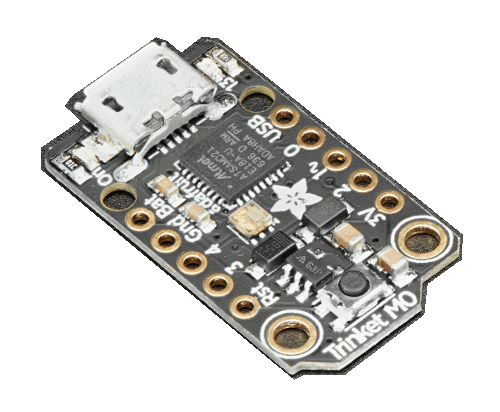 The Adafruit Trinket M0 Learn site  has detailed information about the board including pinouts  and the schematic . The SAMD21 MCU is configured to use the 8 MHz internal oscillator with the on-chip PLL generating the 48 MHz system clock. The internal APB and GCLK unit are set up in the same way as the upstream Arduino libraries. The SAMD21 MCU has 6 SERCOM based USARTs. On the Trinket, SERCOM0 is the Zephyr console and is available on pins 3 (RX) and 4 (TX). SERCOM2 is available on pins 2 (RX) and 0 (TX). The SAMD21 MCU has 6 SERCOM based SPIs. On the Trinket, SERCOM1 is used to drive the DotStar RGB LED. SERCOM0 can be put into SPI mode and used to connect to devices over pin 2 (MISO), pin 4 (MOSI), and pin 3 (SCK). The SAMD21 MCU has a USB device port that can be used to communicate with a host PC. See the USB Samples sample applications for more, such as the USB CDC ACM Sample Application sample which sets up a virtual serial port that echos characters back to the host PC. The Trinket M0 ships the BOSSA compatible UF2 bootloader. The bootloader can be entered by quickly tapping the reset button twice. Connect a 3.3 V USB to serial adapter to the board and to the host. See the Serial Port section above for the board’s pin connections.